After Typhoon Haiyan, the biggest in the world, devastated large areas of the country in 2013, CARE Philippines helped over 15,500 families to rebuild their homes. Funded recovery programmes tend to be expert-led rather than community-led and people are typically displaced from their communities and given emergency shelter. But the people affected cannot always wait for outside support and ‘self-recovery’ accounts for around 90% of all the repairs and rebuilding of homes after a natural disaster. This programme supported the ‘self-recovery’ of lives and homes after the typhoon hit, by providing guidance, equipment, cash grants and technical assistance. By using locally available materials and debris from destroyed houses they have helped families to avoid relocation, retain the rights to their homes and land, and to maintain their social ties. Through training on how to make their houses safer, local people have become more resilient to natural disasters. Support for ‘self-recovery’ is an approach that could reach a much greater scale. Combining basic guidance, simple tools and resources allows humanitarian agencies to help more people. It makes the most of natural human resilience and enables people to take charge of their own recovery. 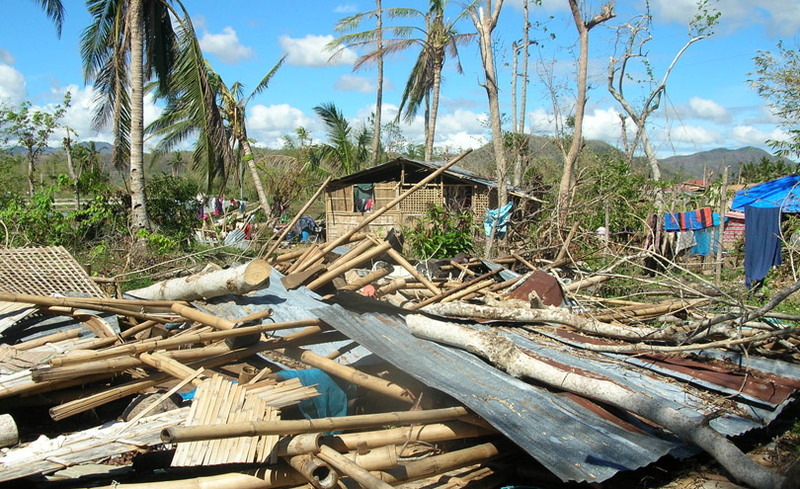 In 2013, Typhoon Haiyan devastated large areas of the Philippines causing significant loss of life and destroying approximately one million homes. Through the Post-Haiyan Self-Recovery Housing Programme (2013-2016) CARE Philippines helped over 15,500 families made homeless by Haiyan to rebuild their homes. CARE Philippines is one of CARE International’s country offices. There are over 70 such offices across the world. CARE International is a non-governmental organisation which works to defeat poverty and achieve social justice through projects tackling a wide range of social issues including emergency response after natural disasters, education, food security, HIV/AIDs, climate change, maternal health and the empowerment of women and girls. Each of CARE’s national members works independently to lead programmes, raise funds, advocate on key issues and communicate to the public in their country. 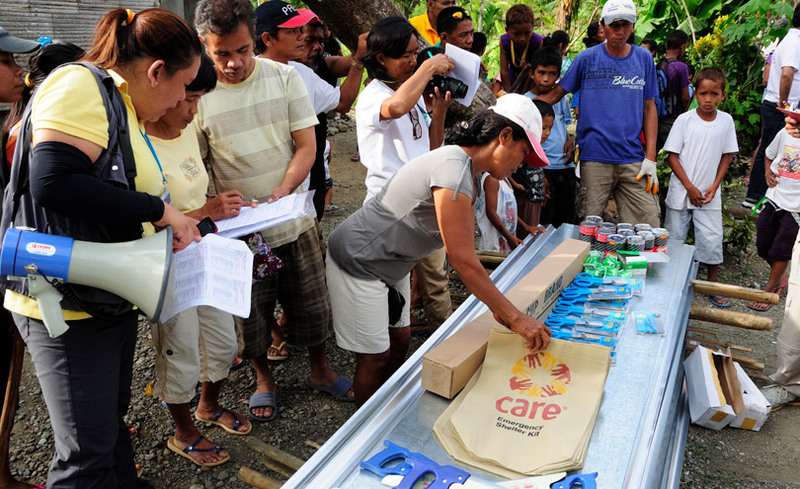 CARE Philippines has been operating since 1949 in areas which are extremely prone to natural disasters. They develop projects which respond to the needs of the most vulnerable. This project was delivered in partnership with Accord (Assistance and Cooperation for Community Resilience and Development Inc.) and other local actors. All phases of the rebuilding work were done in line with the families’ wishes and kept affordable so that they could work within their means. Families were supported to rebuild their homes themselves, hence being called a ‘self-recovery’ approach. 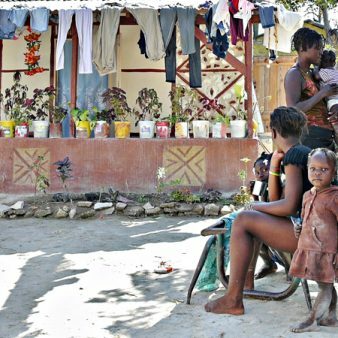 Working with families to develop their own housing is different from the majority of natural disaster responses which tend to focus on temporary solutions built quickly by external contractors. The ‘self-recovery’ approach also helps families to feel more empowered and have a stronger sense of ownership over decision-making, their housing and their lives in general. The Post-Haiyan Self-Recovery Housing project had a strong emphasis on supporting the families who were most severely affected and most vulnerable following the disaster. This was partly because it was felt that they were least likely to be able to resolve their housing problem without support but also because enabling very vulnerable people to have an active role in delivering their own housing solutions was seen as very important. With the support of the programme groups of ten or more families worked together as communities to share the burden of construction. Each rebuilt home is unique, tailored to the needs and means of the family who built it. Some families also benefited from livelihood grants to help them develop small businesses after the loss of jobs in many sectors (including agriculture) after the typhoon. The project provided technical assistance, materials and cash grants to support some of the country’s most vulnerable families to build new homes. This included training people in building skills and also providing the expertise of carpenters who travelled to different areas to help families with construction. Initial materials for essential repairs (including roofing sheets, hurricane strapping and tools and nails) were supplied by CARE. Families then bought other materials using cash grants. The homes that were built were owned by the families so affordability is not an ongoing issue. The Post-Haiyan Self-Recovery Housing Programme developed ‘Build Back Safer’ guidelines which helped families ensure that repaired or rebuilt homes were more resilient to natural disasters. Residents were trained in how to use the guidelines through a mixture of community seminars and individual support. Although the guidance was provided by CARE, control and decision-making about rebuilding was firmly in the hands of the families. At a national level the Department of Social Welfare and Development in the Philippines government is currently considering if the ‘Build Back Safer’ guidelines developed through this programme should be adopted to help deal with natural disasters in the future. The aim of the Post-Haiyan Self-Recovery Housing programme was to support vulnerable families to rebuild their homes in the aftermath of Typhoon Haiyan. It also helped replace jobs and incomes lost as a result of the typhoon. To target some of the most vulnerable people in rural communities, who are often missed by traditional post-disaster reconstruction projects. This included older people, widows and widowers, people living with disabilities, single women and women-headed families, pregnant women, women with young babies and large/extended families. To provide training to families so that they could develop their own housing to a better standard than before the storm, increasing their resilience to further natural disasters. This also provided new skills they could use in the future. To give materials to families so essential building work could be carried out. To provide families with cash grants so they could buy more building materials and/or labour if they were unable to carry out the work themselves. To develop ‘Build Back Safer’ building guidelines so that resilient building practices could be followed at that point and in future, creating a legacy of improved construction techniques. To encourage the development of new opportunities for employment and income generation to replace what was lost as a result of the typhoon. Offer an alternative to traditional post-disaster housing by demonstrating that working with people who are actively involved in ‘building their own recovery’ can be successful and effective. As many as 4.1 million people were made homeless and more than 10,000 people were thought to have died in the affected areas after Typhoon Haiyan struck in 2013. It was the strongest tropical cyclones to have ever been recorded. 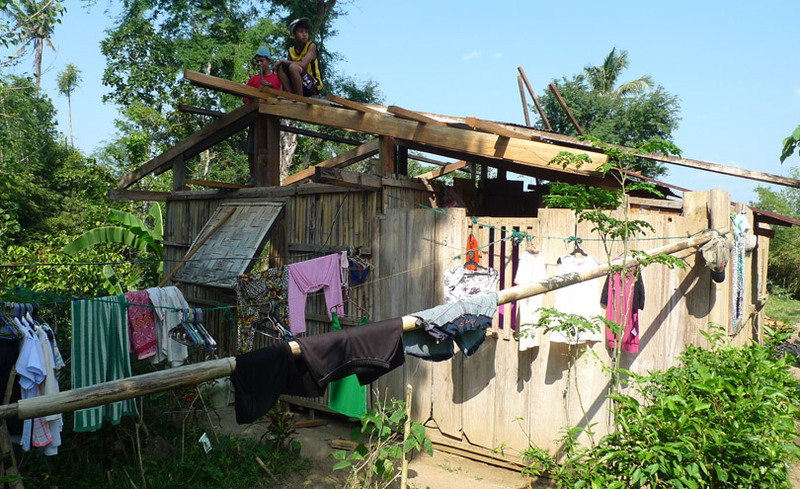 Many homes in the Philippines are made of timber and bamboo and could not withstand the force of the typhoon. Over one million homes were damaged with almost half of these being totally destroyed, so there was a significant and widespread need for rebuilding. In addition to typhoons the Philippines is prone to multiple hazards including earthquakes and volcanic eruptions. Eighty-one percent of the country’s population are vulnerable to typhoons and the country is third in the world after Vanuatu and Tonga for being most prone to natural disasters. Since Haiyan, a further three particularly strong typhoons (Hagupit, Haima and Nok-Te) have hit the Philippines and in February 2017 a 6.7 magnitude earthquake also affected the country. 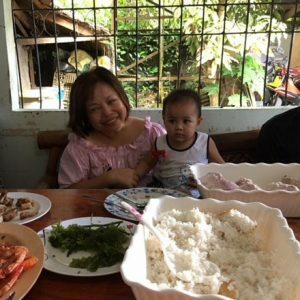 The CARE Philippines programme worked in Geographically Isolated and Disadvantaged Areas that were hardest hit by the typhoon. These included barangays (wards) on the islands of Leyte, Samar and Panay. These wards are small rural communities who rely on farming as their main source of income. This work is often supplemented by running small convenience stores but there are few opportunities for income generation. Average incomes in these areas are low (US$40-80 per month) so rebuilding without outside help from CARE Philippines would have been very difficult. The ethos of ‘self-recovery’ meant that villagers were able to control the rebuilding of their homes and the construction work they undertook was fitted around their everyday life. For example, if they wished to prioritise a day working rather than completing any building work this was their personal choice. This freedom and flexibility meant people could still earn an income whilst completing building works. The Post-Haiyan Self-Recovery Housing programme ensured that the most vulnerable people in local communities were selected as it was felt that they would be least able to carry out successful self-recovery without support. As a result of this programme, over 15,000 people who had been made homeless by the typhoon are now living in stable housing that they have built themselves. The programme was community-led – resident choice and input into housing design was prioritised throughout. Following training families completed the rebuilding themselves but could ask for help from carpenters funded through the programme. Grants were also given out which meant that people who were unable to do the building work themselves could pay others to do it. Communities also grouped together to share labour and help each other. These groups were informal but often ten or more families would come together to work on their houses as a team. Construction techniques that strengthen homes, for example cross-bracing. Building strong foundations as a starting point for construction. Ensuring roofs are securely nailed onto the structure. Additional grants given by CARE Philippines helped some families develop small businesses in addition to their homes helping them generate income and support the wider recovery of the community. CARE Philippines was the main lead on the project. CARE also collaborated with Assistance and Cooperation for Community Resistance and Development (ACCORD), a Philippine organisation which provides capacity building for communities and promotes resilient building practices. ACCORD led on providing the training to educate residents how to rebuild sturdier homes using the ‘Build Back Safer’ messages. In addition to ACCORD, other smaller organisations also acted locally as an interface between CARE Philippines and the communities. They were responsible for much of the day-to-day implementation of the programme. These include cooperatives and NGOs such as the Leyte Center for Development, the Metro Ormoc Community Multi-Purpose Cooperative, and the USWAG Development Foundation. Ensuring that over 15,000 people affected by the typhoon now have a safe place to live which is more resilient than their previous home. Developing an increased sense of involvement and ownership due to the self-recovery approach. Significant scale was achieved as resources were focused on enabling people to help themselves rather than paying for more expensive contractors, who would have delivered fewer homes for the same budget. The materials used and the focus on the Build Back Safer building guidelines means homes built have been a big improvement on homes where families lived before the typhoon. The focus on both housing and income generation has meant families have a safe home and new job opportunities. The development of ‘Build Back Safer’ guidelines has been seen positively by the Philippines government’s Department of Social Welfare and Development. They now wish to incorporate these codes into future natural disaster responses. The programme has also helped inspire the academic research programme ‘Promoting Safe Building, supporting safer self-recovery after disasters’ which will highlight the potential of self-recovery approaches in disaster responses. The majority of costs were funded through CARE’s fundraising and donations, for a total of 145.6 million Philippine Pesos (US$3 million). 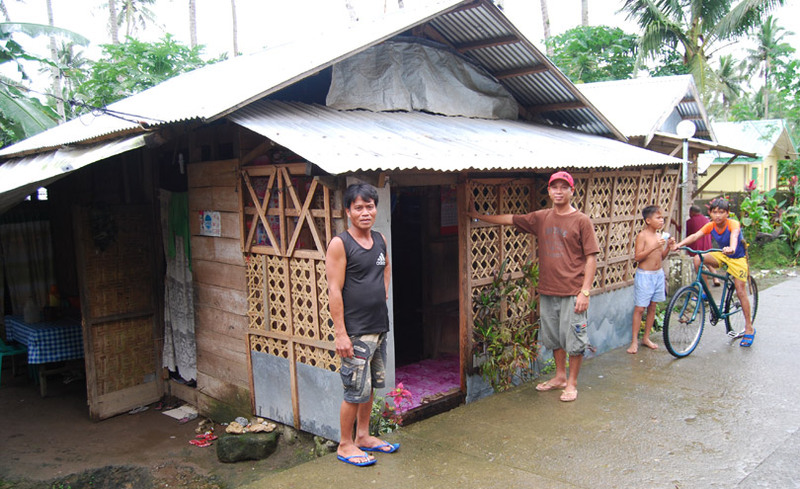 Homeowners were provided with grants of 3,000 Philippine Pesos (approximately US$55) to buy building materials. When this grant was combined with the materials which CARE provided (roofing sheets, hurricane strapping and nails and tools) the total cost to CARE per house was around US$190 dollars. Residents were expected to provide some financial contribution. However, the most vulnerable families (about 45% of the beneficiaries of the programme) received a top up grant of 5,000 Philippine Pesos (approximately US$90) if they could not afford to contribute. Families also salvaged materials from storm debris and provided free labour to reduce costs. Additional livelihood grants were given by CARE from their fundraising reserves to many of the families to buy, for example, livestock. There is even an example of 70 families coming together to purchase a rice mill. The financial support provided through the programme meant that families were less likely to get into debt in the rebuilding of their homes. The use of ‘self-recovery’ at such a large scale is innovative when it comes to post-disaster work on housing, as recovery work is often expert-led rather than community-led. This programme was able to reach more of the population by using the self-build method. Its success has demonstrated the beginning of a shift in mainstream humanitarian shelter practice towards recognising that self-recovery can be an effective, quick and sustainable post-disaster response. It is the norm for the community themselves to start the recovery process after a natural disaster. The Post-Haiyan Self-Recovery Housing programme was able to respond quickly and in a way that built on the recovery work the community had already started. CARE’s comprehensive recovery package also makes it innovative. 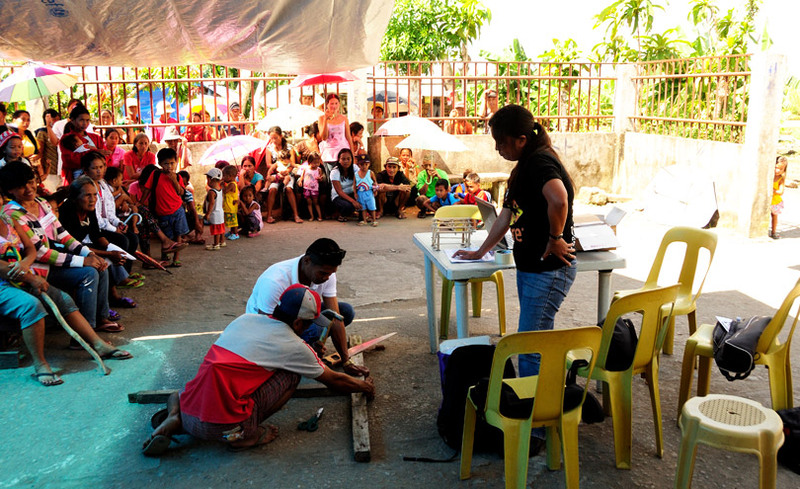 Right after the typhoon, CARE and local partners gave food, water and shelter kits to beneficiaries. Orientation on the Build Back Safer guidelines was given before giving out the shelter kits to ensure beneficiaries knew how to use them. Livelihood grants were given to the communities and CARE and local partners continue to implement livelihood recovery projects in the affected communities. This approach is quite different from typical disaster aid projects that mainly focus on providing one product (e.g. temporary shelter or core housing or relocation) for a specific period of time but do not, for example, follow up with livelihood projects which beneficiaries need in order to earn a living and stay in the community. The project put control and decision making in the hands of the families themselves rather than the implementing organisation, giving families greater ownership over what happened to them. Families will also be able use the building techniques they have learnt in the future. The fact that cash was given to families so that they could choose to purchase their own building materials and/or pay for labour meant that work was carried out more quickly than if they had had to wait for help to get to them. The response could begin swiftly thanks to this approach. The focus on both housing and income generation is a more holistic approach to recovery, recognising that homes and livelihoods are often interconnected. The project used local building materials and salvaged debris after the typhoon to reduce environmental impact. Hundreds of thousands of palm trees were blown down by the typhoon and coco lumber became the main construction material used to build the houses. This also meant that materials were sourced as locally as possible, often in the vicinity of the new buildings. The programme also allowed local entrepreneurs to set up small chain mills to make use of the fallen timber, providing new job opportunities. The use of valuable hardwood, which is less environmentally sustainable, was limited to foundation stub posts and was often recycled from destroyed housing. Bamboo was also used, which is a fast growing and environmentally sustainable crop. ‘Self-recovery’ supports the use of local materials and imported, high embodied energy products are limited to a few materials. Houses are also built in the same areas where they were before meaning that little or no new land is needed for construction. The ‘Build Back Safer’ guidelines developed by the programme helped to educate communities in sustainable building practices. The Post-Haiyan Self- Recovery Housing Programme finished in 2016 and its goal was not to achieve financial sustainability for the programme itself beyond that date. However, this ‘self-recovery’ programme has been very careful to work within the families’ own means so the housing itself is affordable for them. Once rebuilding was complete, over 15,000 households owned their own home with no reliance on future funding and no rental payments. Cash grants given by CARE were less than the total value of the cost of rebuilding. This meant that some families had to use their own money to fund their rebuild within their available resources. The cash loans helped families start the construction process. As local labour was used in the rebuilding, if finances allow in the future, families can continue to make home improvements using these contacts. Although the long-term impact of the programme is greater financial resilience within the communities, recovery following large scale natural disasters will always require significant amounts of external funding to deal with the immediate devastation caused. 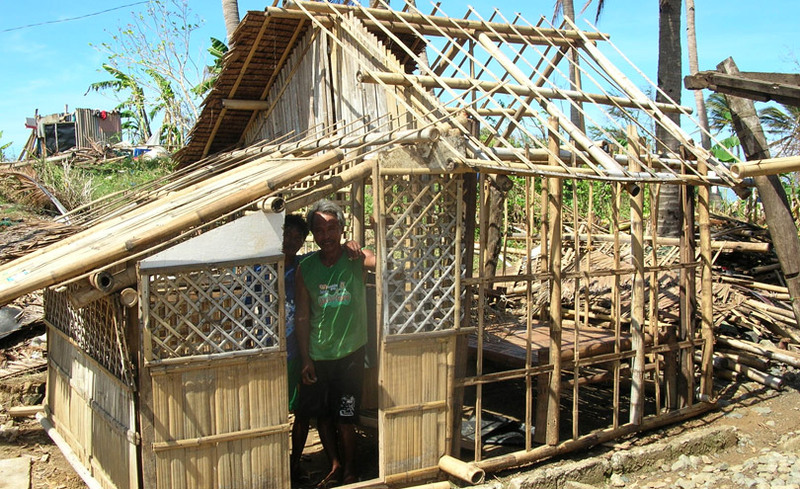 Communities have been able to stay in their villages after the typhoon as the project has enabled new homes to be built. As the homes are more resilient families should be able to live in them for years to come, even if further natural disasters hit. Community cohesion and cooperation were developed through the project’s focus on people working together to rebuild their homes. In the Philippines, this community spirit is called bayanihan. Many of those involved in the project felt the project allowed bayanihan to be realised as people controlled the creation of their own homes. Neighbours came together to help each other which made people feel they were working towards a common goal. Being encouraged to take charge of their own recovery after the typhoon helped some families to deal with the psychological trauma of the event. The magnitude of Typhoon Haiyan meant that people’s livelihoods were lost as well as their homes. The project helped many families to develop new skills and access new jobs. Income generation opportunities such as setting up small businesses were supported using grants. The construction skills developed through the project were important and the techniques learned are now educating future generations on sustainable building practices. CARE is committed globally to the empowerment of women so a gender-sensitive approach was adopted to ensure equal inclusion of women in the project. 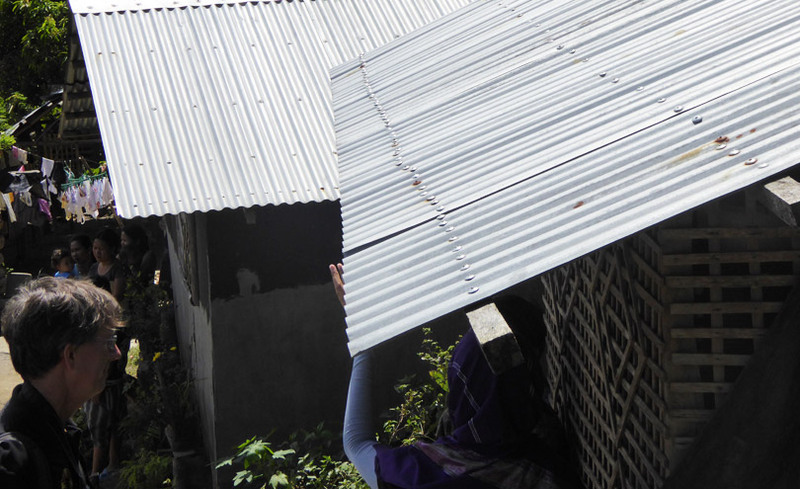 CARE Philippines particularly encouraged women to take an active role in decision-making and construction. Focus group discussions at the beginning of the project were almost entirely made up of women. In their role as key activists in the community the women also helped the carpenters give technical support by having conversations with their neighbours to find out their needs before the advice was given. It was made easier for women to take part in project management and their participation in the construction activity as a whole increased. The project faced two major challenges. Firstly, some families struggled to find money to complement the grant from CARE Philippines which they needed to complete their homes. CARE responded to this by distributing a second ‘top-up’ grant to families who were most in need. The combination of support led to a 92% successful completion rate of homes rebuilt through the CARE programme. The provision of essential materials at the start of the project also tried to ensure that families would be able to rebuild their homes to a good standard without having to borrow or spend large amounts of money. A second major barrier was ensuring that families followed the Build Back Safer guidelines when constructing their new homes. This was addressed by the introduction of a team of carpenters who gave technical assistance to families. In addition, the materials given at the start of project were chosen to help families successfully follow the guidelines. Future programmes need to review whether to target the most vulnerable or whether other similar programmes should be designed to benefit whole communities. Households that had already rebuilt before the programme did not benefit but in future the approach could be redesigned so these households might also have access to grant. If the programme is transferred there will be a need for better integration between the housing project itself and other sectors such as water and sanitation. In some cases there was a lack of compliance with Build Back Safer techniques which might have been avoided if further training and support were offered. It is more effective for materials and tools to be collectively bought by communities rather than individuals. This strategy has been implemented in other programmes. More support is needed when families are unable to undertake construction themselves. 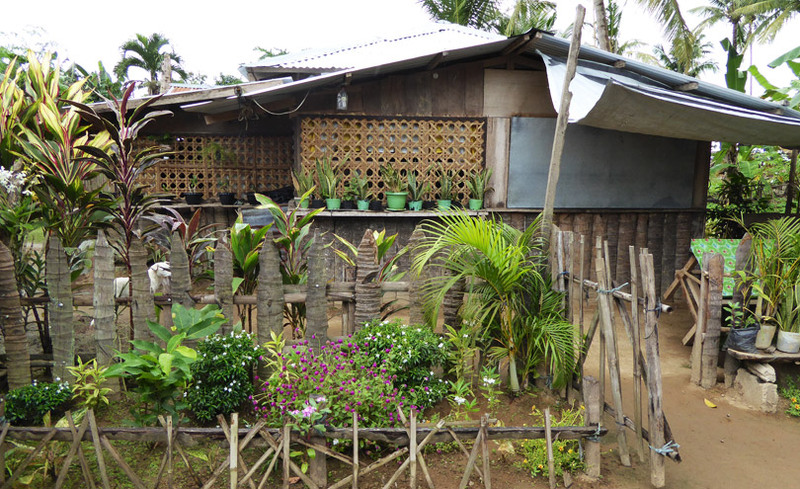 The Post-Haiyan Self-Recovery Housing Programme has been evaluated a number of times in different ways. Throughout the programme CARE Philippines produced regular reports for donors and an evaluation that compares it with other responses to Typhoon Haiyan is being completed. CARE Philippines is currently producing a final presentation of the programme for donors including Disaster Emergency Committee (DEC), Global Affairs Canada and Diagio. The CARE International UK shelter team has carried out two evaluation projects. One was completed after the first year of the programme, looking in detail at the levels of completion of houses. They discovered that the majority of houses had been completed to an adequate standard in that they had a safe roof and walls and had successfully implemented the Build Back Safer guidelines. Some residents, however, felt their homes were incomplete and had further ambitions for improvements such as plywood walls rather than bamboo. They felt they could not achieve this due to lack of money. There was also concern by residents over the vulnerability criteria and selection process used. The second evaluation looked more broadly at the level of recovery and the lessons that can be learned from the programme. Despite the resident concerns above, both evaluations were positive overall and found that in general better built, stronger, often bigger homes had been successfully constructed. Families also expressed an evident sense of pride in and ownership of their achievements. The evaluations have been used to inform subsequent post-disaster responses in Vanuatu, Fiji and Nepal. A separate evaluation by Habitat for Humanity GB and CARE International entitled ‘Lessons from Haiyan’ offering a comparative review of evaluations and learning documents from the shelter response to Typhoon Haiyan is in progress. The CARE International UK research team is currently evaluating the perception of ‘recovery’ from the perspective of the affected families. This work is part of an interdisciplinary research project that investigates households’ self-recovery trajectories and how safer construction practices can be more effectively integrated into humanitarian shelter responses. The project has not had any specific recognition to date. However, its work has been cited in various reports and articles as an example of good practice in post-disaster recovery. A recent Euronews article details the programme and the joint work of CARE Philippines and ACCORD. They have also been featured in the Forced Migration Review Journal and on the Humanitarian Practice Network. CARE International has recently launched a research collaboration between the Overseas Development Institute, British Geological Survey and the Engineering Department of University College London. It will research building techniques and self-recovery processes from the perspective of those affected, using the programme as a case study. The programme was initially carried out on three Islands (Leyte, Samar and Panay). Since implementation in these locations CARE Philippines has started similar projects in response to Typhoons Hagupit/Ruby (2014) and Typhoon Haima (2016). These transfers were adapted based on lessons learned. For example building materials were purchased collectively to provide cost savings. Residents came together to create a list of what tools were needed instead of each family being given individual materials. The training element was still key to these projects with the knowledge of local carpenters being used to benefit the whole community. The programme is being used as a case study to inform wider research on the effectiveness of ‘self-recovery’ as a post-disaster construction technique. It is hoped it can act as a model for future projects. Lessons have influenced similar projects in Fiji, Nepal and Vanuatu carried out by CARE. Minet is the Executive Director of LCDE (Leyte Center for Development), one of the organisations who assisted CARE Philippines after Typhoon Haiyan. Although her organisation helped 23,000 families over 4 months she was also a victim of the devastating impact of this typhoon. CARE Philippines approached us and asked if we would help them to reach the survivors who were in a worse condition than us. We agreed and actually being able to do something positive in such a negative situation was so empowering. I was in Manila when the typhoon struck. It took me 4 days to get home to Tacloban which normally takes a few hours! I didn’t recognise the place. Houses with no roofs. Trees with no leaves. When I reached the bridge nearby I realised that this was my house and my office. It had been destroyed. We lost everything. Everything we had saved up for over the decades had gone. The main thing was the people I worked with were all alive and okay. Before I started work I had to take a moment. I had to cry for a while before we had our meetings and planned the next steps. I just needed to process this situation. Our roofs were blown off by the typhoon which meant we had to use transparent fruit covers as our make shift tents. We looked at the positive side – at night we could see the stars and they were so beautiful. I had worked in this area for 30 years. 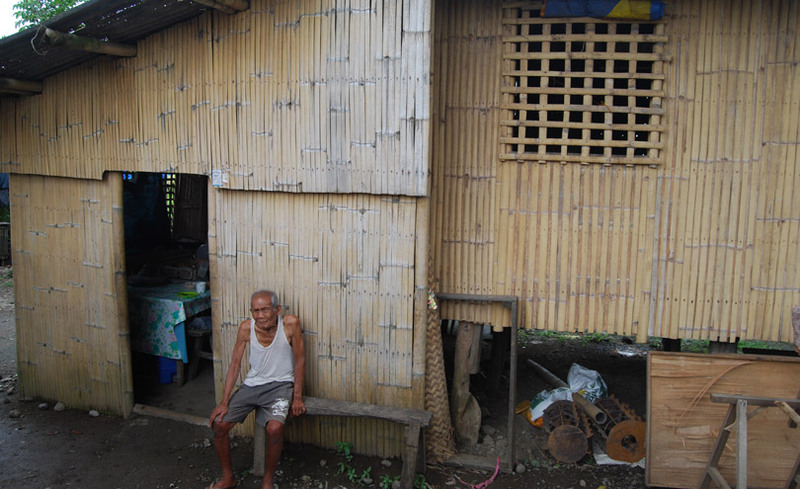 But after Haiyan came I wanted to leave – I didn’t know if I could manage the sacrifice. We didn’t have water or electricity but my colleagues decided not to leave. So it would be so embarrassing if I left. My family wanted me to leave. But my colleagues and I decided to stay and help. We had nothing – just us. We told our partner organisations that we could do work for them but we needed their help to get back up and running. So for instance, CARE gave us a generator and other partners gave us computers and a satellite phone. A lot of looting was happening but they didn’t loot us. We are an NGO who were helping other people. Our work has always been deeply rooted in the community. We have breadth and we have reach. We had an established network already so we could assist in the delivery of CARE’s toolkits and help. We already knew the communities and we had the contacts so we could reach them. This made it quicker and easier to help people in remote places. This enabled people to rebuild their lives quickly and as safely as possible. We were able to help CARE reach remote rural areas so people had access to the shelter kits and advice they needed to build back their houses to be more resilient and establish ways they could generate income such as through growing and selling rice.